Stephanie McMahon has been a very outspoken advocate about the women of WWE. In a sit-down interview with Variety at CES, she spoke about her dream match. She also spoke about how the evolution of the women's division has happened in WWE. Thanks to WrestleZone for the transcript. Stephanie McMahon is the Chief Brand Officer for WWE and has been instrumental in the women's evolution. Under her leadership, the women of WWE have gone from a sideshow attraction to the main event match. Stephanie McMahon has also been an on-screen character for a long time now. She was last seen on TV when the McMahons took charge of RAW and SmackDown Live and eliminated all existing middlemen. Prior to that, she was the Commissioner of RAW, who'd sent Kurt Angle away on vacation and put Corbin in charge of everything on RAW. What happened was that in our developmental system, [Triple H] started recruiting athletes over models for both men and women. He started training women the same way the men were trained and giving them the same match time, and opportunities on television. As a result, they started to rise and truly steal the show. 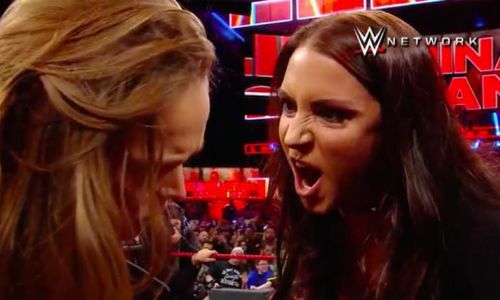 The women of WWE seem on course to main event WrestleMania 35. Maybe Stephanie McMahon's dream will come true very soon. One wonders who will be in the main event of WrestleMania if the women main event. Should Stephanie McMahon wrestle again? Let us know in the comments section below.